The Bowery is a small neighborhood lying along the avenue of the same name. It was the home of the wealthiest residences of Manhattan in the late 1700s, but it went downhill through the 1800s and was New York's most notorious slum by the Great Depression of the 1930s. Johnny Storm once wandered into a Bowery flophouse and encountered an unusually strong amnesiac homeless man with long shaggy hair and a matted beard. Recognizing him as Namor, Johnny burned away the man's beard and excess hair and then dropped him into the East River, restoring his memory. The Whitehouse Hotel at 340 Bowery is a former flophouse, or at least formerly it was entirely a flophouse. Its entrance is the blue door in the picture above. Well, not exactly a flophouse. It was, at least recently, a single-room occupancy or SRO men's hotel, in which everyone gets their own small bedroom. 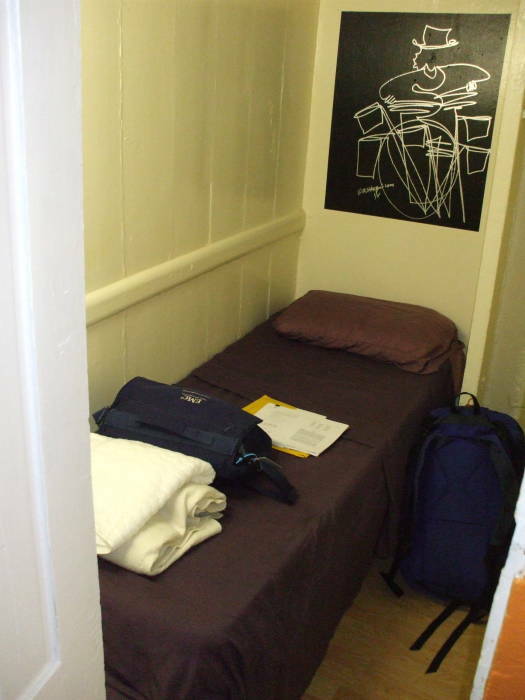 A dormitory has one or more large rooms with several beds. A flophouse is a step further down — no beds, you flop down on the floor and sleep. One side of the Whitehouse was still a single-room occupancy men's hotel through 2014. The other side was a low-priced hostel where visitors to New York could get a single room of their own. About 6'x4', but it's all yours for just $30-35 per night. Yes, that's the entire room in the first picture. In the second picture we're looking down the passageway. Places like these were known as SRO or Single Room Occupancy hotels. More places were built or converted in the 1940s as accommodations for men returning home from World War II. Many of them checked in and never left, living here 50 years or more as the Bowery was "Skid Row" from the 1940s into the 1990s. 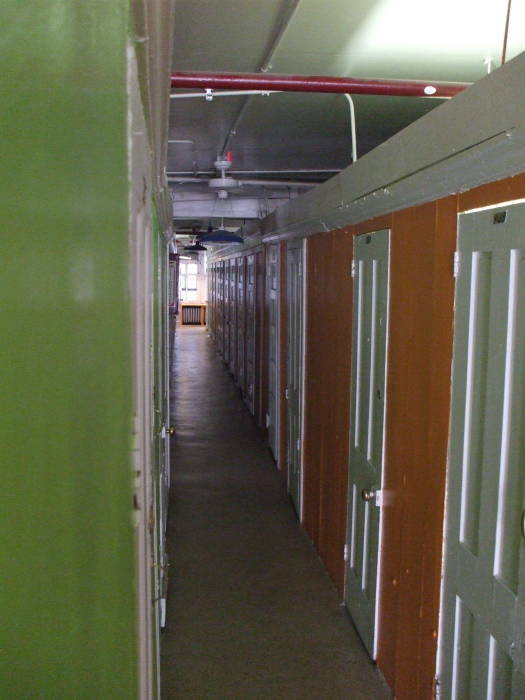 The rooms were usually called "cabins" and were just large enough for a short bed and storage cabinet. The walls did not go all the way to the ceiling, trellis-like wooden frameworks were fastened across the wall tops. The Whitehouse finally shut down for what seems to have been the last time in late 2014. Despite being part of the NOHO Historic Extension, it was sold for the construction of a 9-story luxury hotel. 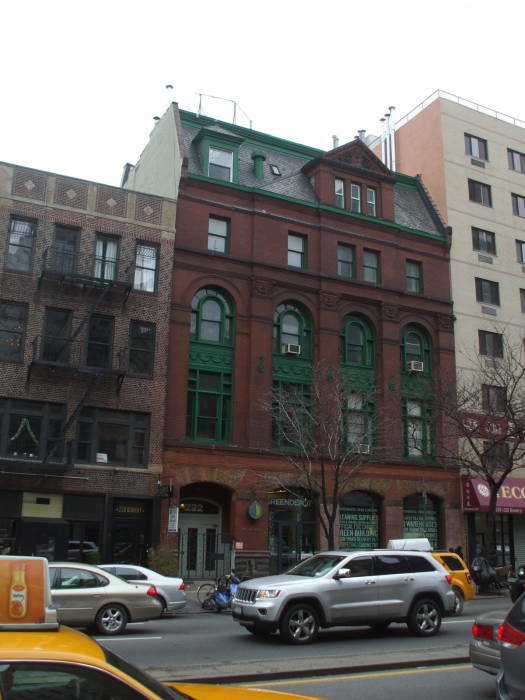 The Sunshine Hotel was at 241 Bowery, it announced in 2014 that it would downsize and convert the second and third floors into commercial lofts. 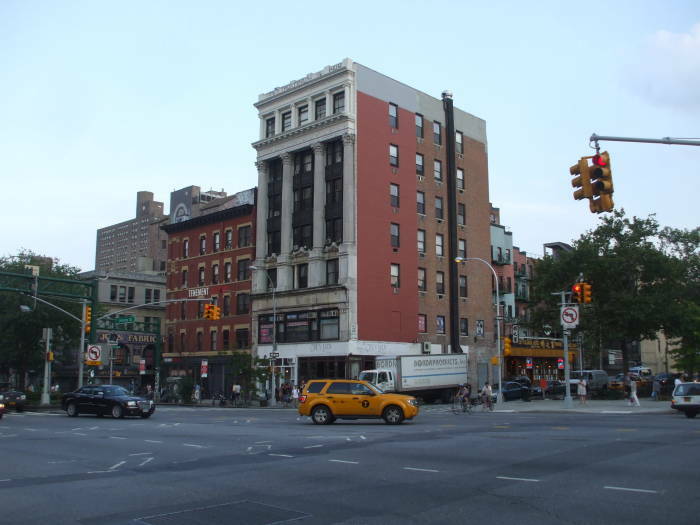 Ace Hotel purchased 225 Bowery, formerly owned by the Salvation Army, for $30 million. 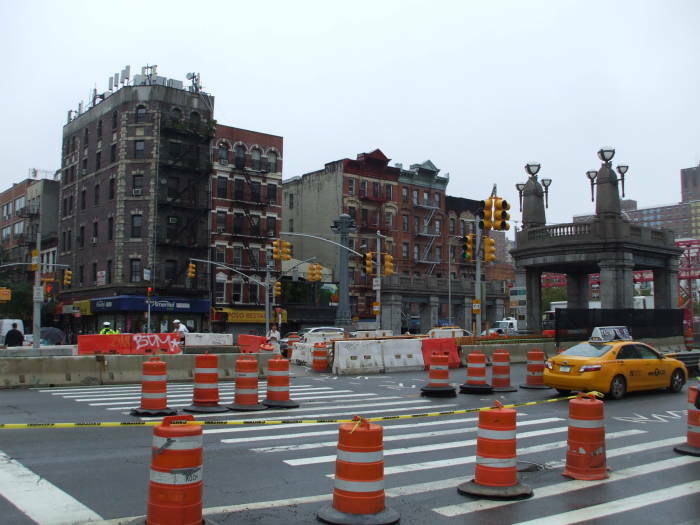 The era of the Bowery SRO is over. 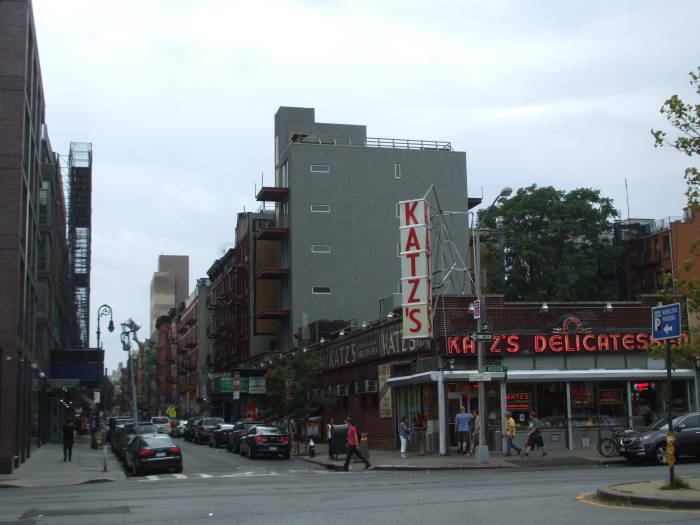 Katz' Delicatessen is on Houston Street, on its southwest corner with Ludlow Street. The more prominent street's name is pronounced how-stun and not hue-stun like the city in Texas. At left we're looking south across Houston and down Ludlow. The business was established in 1888 on Ludlow by the Iceland brothers. Willy Katz joined the business in 1903, and its name changed from Iceland Brothers to Iceland and Katz. Then Willy's cousin Benny joined in 1910, the Katz cousins bought out the Icelands, and it has been known as Katz' Delicatessen since 1910. The business moved to the Houston Street side of the corner around 1917 because of subway construction. Harry Burns and Sally Albright frequented Katz' in the late 1980s. 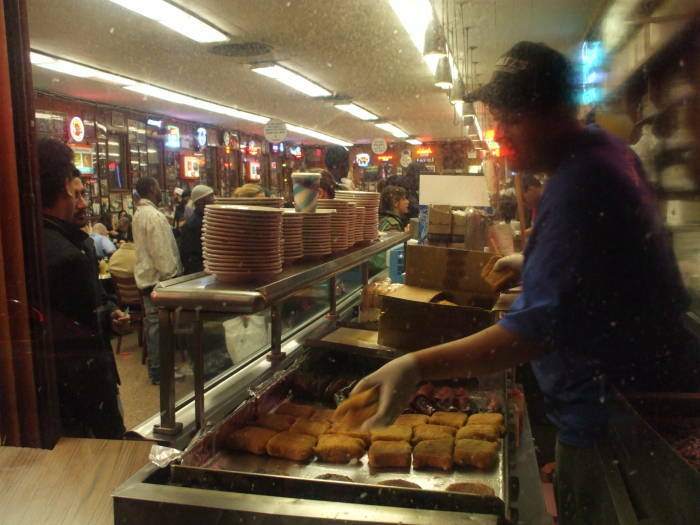 Katz' is kosher-style but not truly kosher. Kashrut or Jewish dietary law forbids consuming meat with milk or milk products. Among the items on Katz' menu are a Reuben sandwich with corned beef and Swiss cheese. 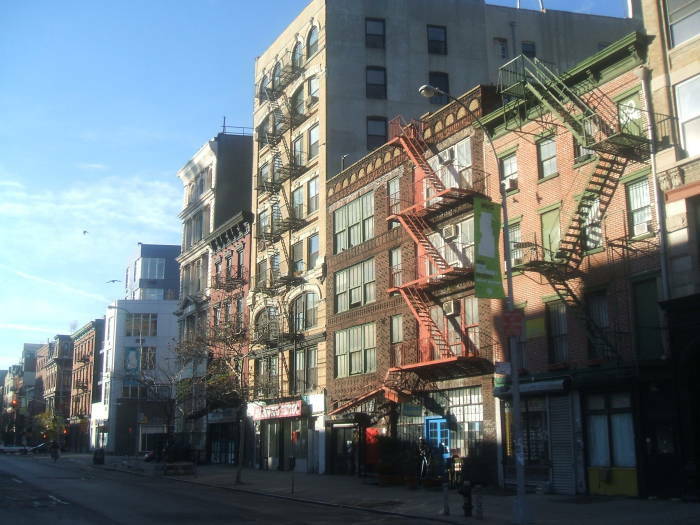 The term SoHo refers to South of Houston, although SoHo proper is considered to be west of here, to the west of Lafayette Street and Centre Street, up to West Broadway, south as far as Canal Street. In this area, Houston is the northern edge of the Lower East Side. 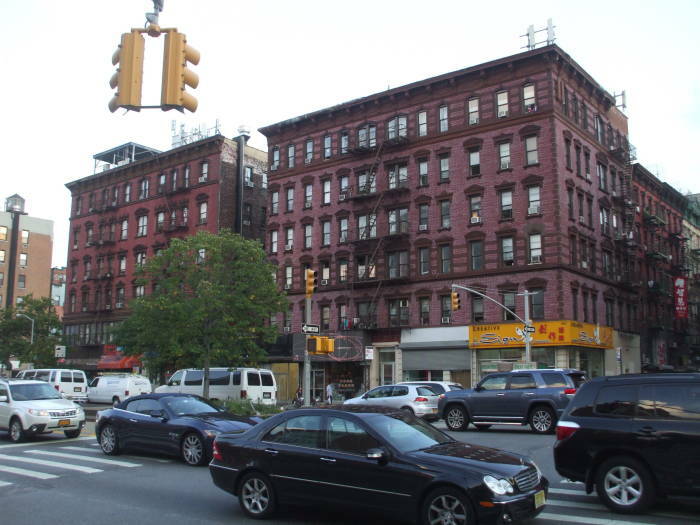 If you were to continue south three blocks on Ludlow, crossing Stanton and Rivington, you would reach Delancey Street, sometimes called Yancy street. 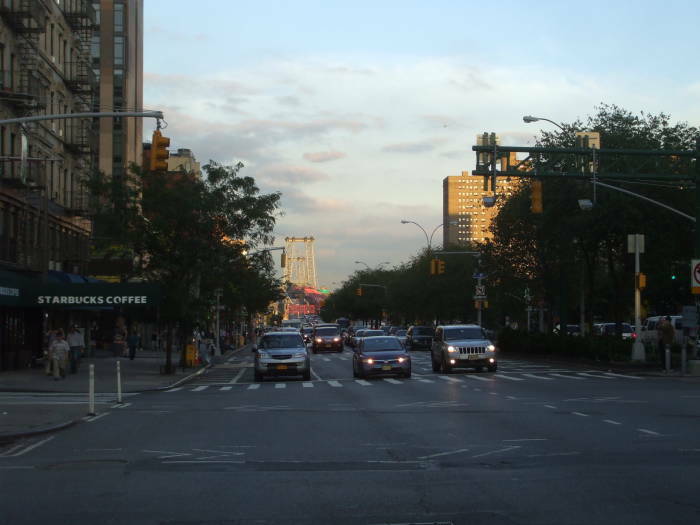 This is another east-west thoroughfare on the Lower East Side, running east from Bowery and becoming the feeder onto the Williamsburg Bridge. 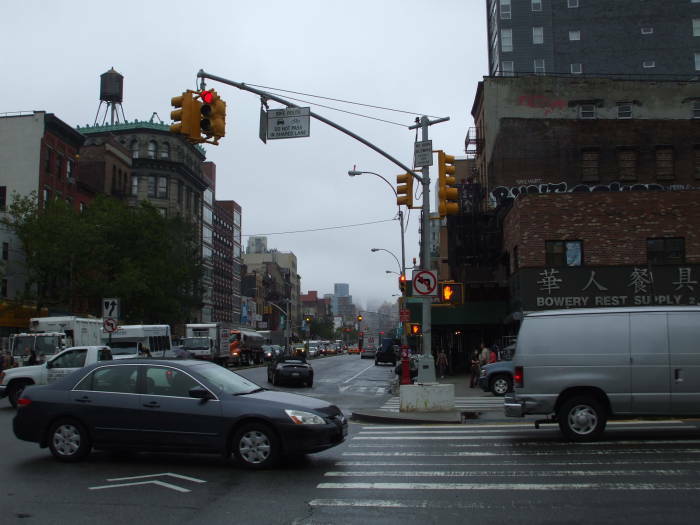 Starting at Bowery and running east, Delancey crosses Chrystie Street, Forsyth Street, Eldridge Street, Allen Street, Orchard Street, Ludlow Street, Essex Street, Norfolk Street, Suffolk Street, Clinton Street, Attorney Street, Ridge Street, Pitt Street, Willett Street, Sheriff Street, Columbia Street (also called Bialystoker Place), Lewis Street, Baruch Street, Mangin Street, and ends at the FDR East River Drive. 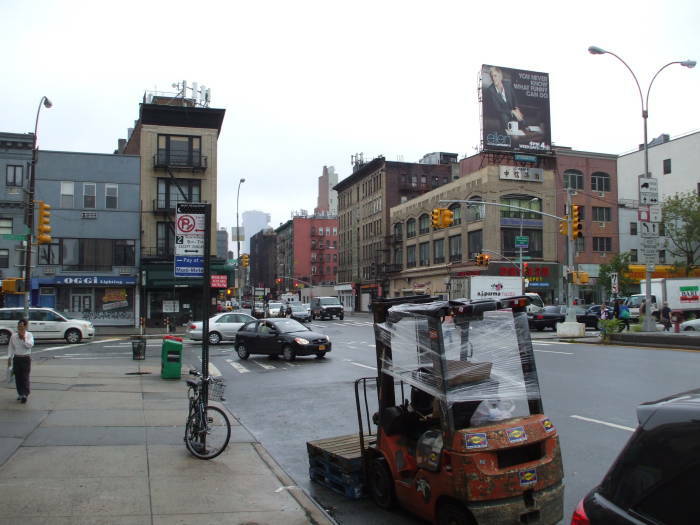 Delancey Street, sometimes called Yancy Street, was a main shopping avenue in the predominantly Jewish Lower East Side through the middle 20th century. Jack Kirby was born in 1917 on Suffolk Street, just off Delancey. The Dead End Kids, the East Side Kids, the Bowery Boys and the Yancy Street Gang all grew up in this area. Immigration trends shifted throughout the 20th century. 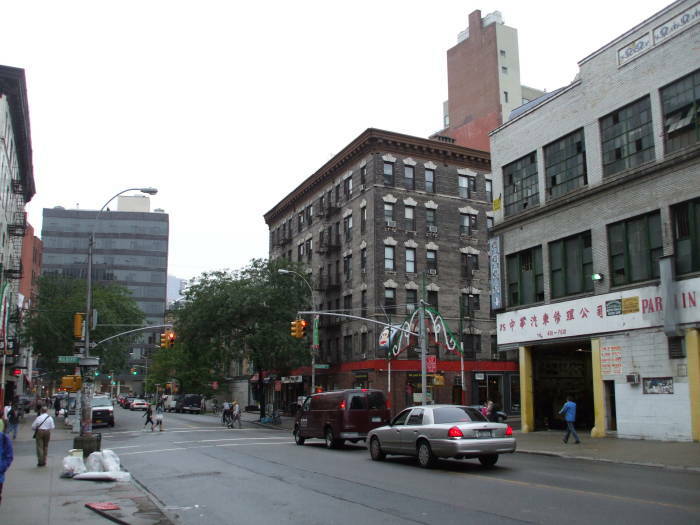 Now the western-most blocks of Delancey penetrate into Bowery's concentration of Chinese family businesses specializing in restaurant supplies. 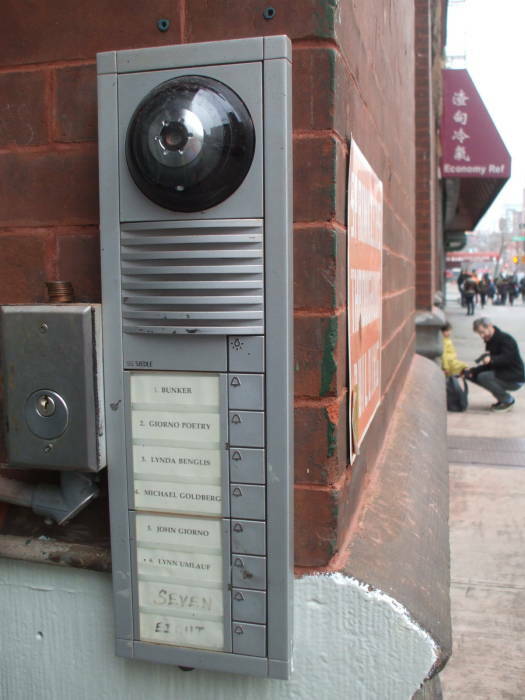 Delancey was the location of the 1983 A-Team operation code-named The Out-of-Towners, in which an extortion racket based along this street was shut down. Benjamin Jacob Grimm was born on Yancy (or Delancey) Street to a poor Jewish family. He had idolized his older brother Daniel, who was killed in a street gang fight when Ben was just eight years old. Ben's parents died soon after that, leaving Ben to be raised by his uncle Jake and Jake's much younger wife, Petunia. Ben received a football scholarship to Empire State University, where he met Reed Richards. He eventually earned multiple advanced degrees in engineering. Ben then joined the U.S. Marine Corps and became a test pilot, flying surveillance missions around Vladivostok. He then become an astronaut for NASA. 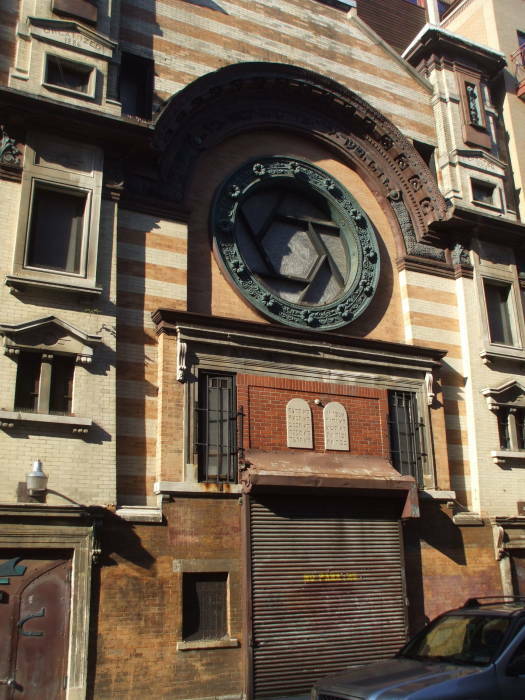 Benjamin Jacob Grimm grew up attending services at this synagogue on Rivington Street, one short block south of Yancy. SoHo has many art galleries. Alicia Masters' sculptures are on display and sold in several of these galleries. Dr. Otto Gunther Octavius's laboratory is at #32 Second Avenue at 2nd Street, in a former small courthouse building which has, at times, housed the Anthology Film Archives. A brilliant nuclear physicist working to develop tritium-based fusion, he devised a set of mechanical tentacle-like arms controlled by a brain-computer interface and capable of great strength, highly precise manipulation, and resistance to radiation. An accident with his fusion reactor fused the metal harness to his body. Peter Parker's apartment is at 187 Chrystie Street between Houston and Delancey. 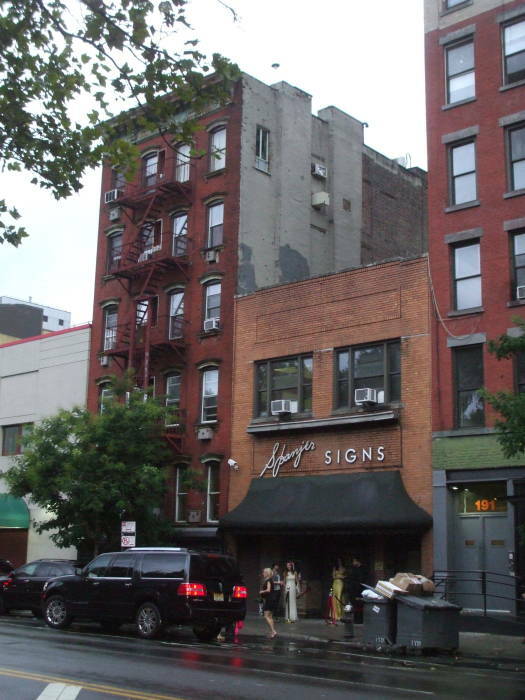 It's the six-story building four windows wide, to the left of the dark awning over the entrance signed as Spanjer Signs. That's actually a bar. Sara Delano Roosevelt Park, named for FDR's mother, is on the opposite side of Chrystie Street. The park is a narrow strip six blocks long, from Houston down to Canal Street. 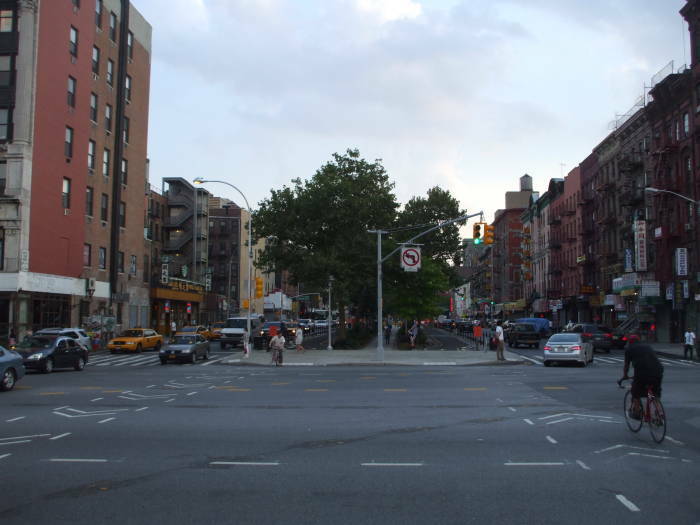 Chrystie Street runs one way south on its west side, Forsyth Street runs one way north on its east side. If we walk around the block from Peter Parker's, on its opposite side we end up on Bowery near the Bowery Mission. 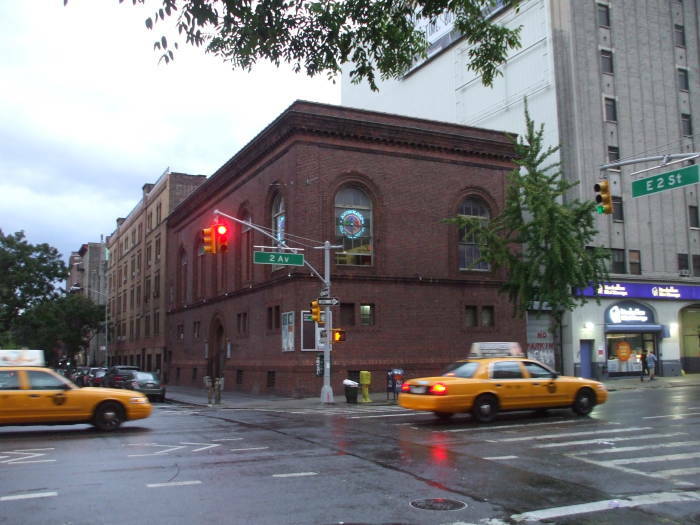 Across Bowery is a former YMCA building. 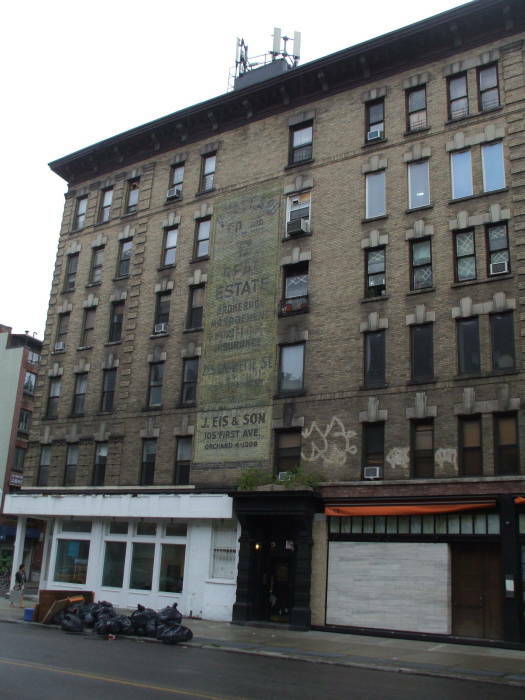 William S. Burroughs maintained an apartment in this building also known as "The Bunker" at 222 Bowery from 1974 until he died in 1997. See the dedicated page for much more on William S. Burroughs in New York.